1st CYBERBUDO Budosai Seminar in Okinawa – Challenge Okinawa! ← 2017 100 Kobudo Kata Challenge participation certificates available for download. We were very lucky to have Terry Wingrove Hanshi visiting Okinawa and sponsoring this special event. Participants included special guests from the Cyberbudo organisation and local invitees. Around 50 people attended including many from Europe and the Americas. 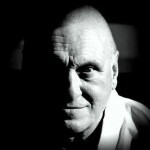 Wingrove Hanshi 9th Dan Hanshi (FAJKO) spent 21 years in Japan and is in his 59th year in karate. He received his 8th dan Kyoshi, 33 years ago in Kyoto. blends te (the precursor of karate) kobudo (weapons) and Ryukyu dance. The name comes from the fact that it was passed down through the noble Motobu family of the udun rank, with the di coming from ti, meaning bujutsu–martial art–in Ryukyuan. Motobu Udundi is considered a “general” martial art in that it makes use of punching and kicking striking techniques, joint locking and throwing techniques known as tuiti, and a variety of weapons. 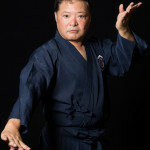 Yoshio Kuba is a 10th Dan black belt and is the head of the Kenpokai in Okinawa, Japan. He was a direct student of Seikichi Toguchi Sensei, who was a student of Chojun Miyagi Sensei and Seiko Higa Sensei. Kuba Sensei epitomizes the understanding of Goju and his understand of its concepts and application is legendary but off and on the dojo floor. He runs a full time acupuncturist practice in Okinawa and is head of the Acupuncture Association in Japan. HOKAMA TETSUHIRO Hanshi – 10th Dan Gojuryu Karatedo Hanshi, President of the Okinawa Gojuryu Kenshi Kai Karatedo Kobudo Association and founder of the first Karatedo museum in the World. 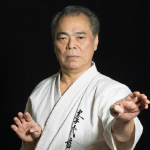 Hanshi Hokama is one of the most knowledgeable Gojuryu Karatedo masters. He has a deep understanding of the “Old Ways” of Karate. He is also a very accomplished and skilled calligrapher, or Japanese SHODO. 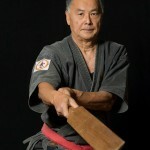 4:00PM-6PM – HOKAMA TETSUHIRO Hanshi. Hokama sensei taught GOJURYU technique for 60 mins, then demonstrated SHODO for participants and produced a variety of beautiful Shodo pieces upon request. Many participants used this excellent opportunity to purchase original and unique pieces of Shodo for their home or dojo. Typically prices per piece were 5000 yen – 10000 yen depending on the size and materials. We reserved a 2 hour 40 seat booking at NOTO NO UMI , featuring a very tasty Okinawan cuisine menu and all-you-can-drink special course! NOTO NO UMI, Naha, Kaniharacho 10-8, 2nd floor. 098-852-1714. Near ONOYAMAKOEN monorail station. Following dinner guests were warmly invited to meet at The DOJO Bar for drinks. Nearest monorail station is MAKISHI.